After 30+ days into my Lenten fast from tree nuts, I’ve found myself simplifying meal preparation by using fewer ingredients requiring of less processing. Thanks to my absolute favourite farm-direct source for fresh fruit (via Lorax Community‘s weekly food cooperative) I found myself with MANY avocados on my hands – many of them ripening simultaneously! As such, I felt it wise to use several at once in various new ways and so… Avocado pesto was created. – Combine avocados, basil, garlic, Celtic salt, and parsley in food processor & blend until smooth (using S blade). 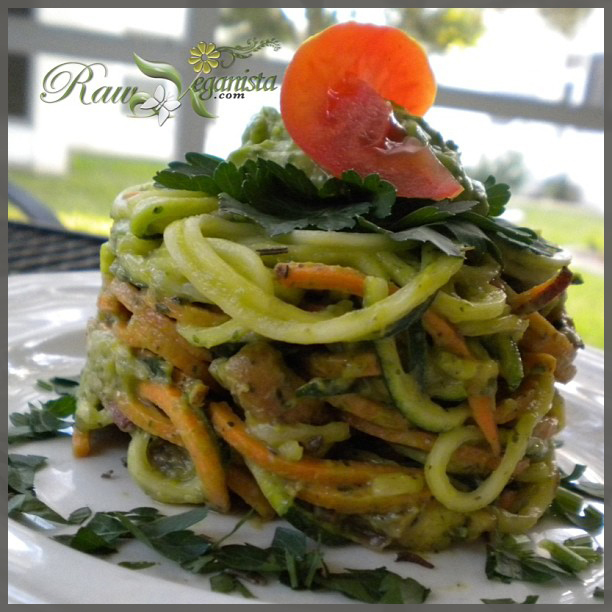 The end result should be a smooth, creamy, and delicious pesto sauce, as shown in the featured image on this page – with spiralised raw courgette & sweet potato. This sauce is perfectly textured and full of flavour, easy to prepare in just a few minutes without any added oil, seeds, or nuts!